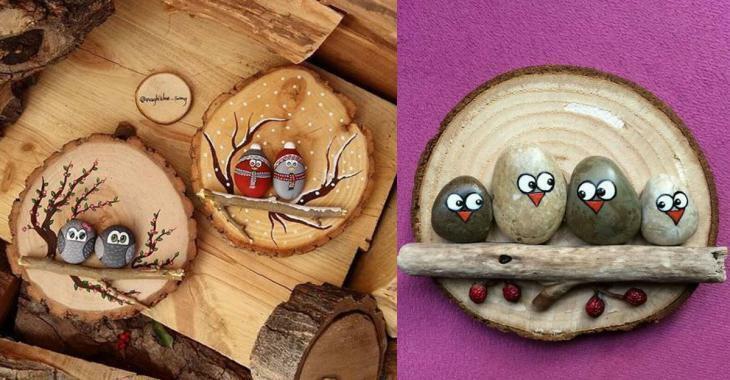 Crafts : Bring small pebbles to life by painting them and making beautiful decorations. Bring small pebbles to life by painting them and making beautiful decorations. 8 beautiful ideas to paint the stones you pick up! Remember when you were a kid and had fun finding beautiful pebbles? Go out for a hike and look for beautiful smooth pebbles to paint them! You can make cute objects to decorate your home! Here are 7 great ideas to inspire you! 1) Represent your favorite seasons with little birds in love perched on a tree branch. All glued on a wooden log painted and protected with a varnish! 2) Do you prefer owls? It's great fun to paint! Hoo hoo !! 3) Simple to do! Add elements of nature glued to your creations! 4) Use your imagination to create all kinds of beautiful ideas! Here are three little birds stuck on a piece of wood! 5) A hot glue gun is perfect for sticking straight pebbles quickly! 6) Do not have a green thumb? Here is an ideal solution for you!